Okay, now I see why this graphic novel series is also categorized as horror. We left off from the last book after a group of cult-like people tried capturing Death, but caught his brother the maker of dreams instead. The Sandman (thus the title of the book) is trying to recoup the power and territory he lost while he was captured. Things rung amok when pieces of the dream lord’s power are being wielded by earthly mortals. Nightmares ensue. In my review of Volume 1, I lauded Gaiman for his creativity. He truly has a gift. As Stephen King says of Gaiman, he’s “a treasure house of story, and we are lucky to have him in any medium.” And as with any Gaiman story, it can go lightly fanciful to full-blown insane. 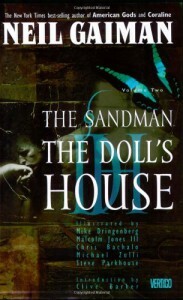 For me, parts of Doll’s House (this Volume 2) dipped into that full-blown insane territory. It’s odd, because I loved that about Gaiman in AMERICAN GODS, but not so much in OCEAN AT THE END OF THE LANE. Much of it had to do with what was going on behind the scenes, which I didn’t think contributed to the story’s progression. In Volume 1, we had some gross things happen to seemingly innocent bystanders. In Volume 2, take this up several notches. Not all of it is for naught; a lot of it ties up in the end—even including some tie-ins to a seemingly random encounter from Volume 1. So yes, read Volume 1 first or you’ll be totally lost. As for the story for Volume 2, I want to save most of it for surprise, but I can say this much: the Sandman continues his journey of recovery, but finds a human that is a vortex between the dream and real worlds. This is a threat to both humankind and the dream world. You can guess how this goes. In the end (literally, epilogue) Gaiman states that he is not going to apologize or explain what just happened. It’s crazy, it’s insane, but most of it ends up making sense in a weird way and a lot of people are going to love it. I know I’m looking forward to reading the next Volume.